Margaux is a beautiful two bedroom / two bathroom villa on a quiet residential complex with its own private heated swimming pool set in landscaped gardens. Margaux is situated on a quiet residential complex, there is a private driveway leading up to the house, once inside you will find a living/dining room with comfortable seating for five people plus a dining table and chairs, unlimited wifi, UK TV channels and a stereo system, two sets of double doors lead out to the terrace with a covered pergola a large table and chairs for your al fresco dining and an electrically heated swimming pool surrounded by sunloungers, also a brick built BBQ next to a door leading into the well equipped kitchen – fridge/freezer, oven, hob, coffee machine, washing machine, plenty of saucepans, china, cutlery and glasses – all you need for lovely meals at the villa. Upstairs there is the master bedroom with king size bed, fitted wardrobes with security safe, two balconies – one to the front of the house with views of Montaña Roja and one to the rear overlooking the swimming pool, garden and mountains, the second bedroom has two single beds (these can be put together to make a double bed if required] fitted wardrobes and a balcony overlooking the front of the house. There are two full bathrooms [bath with shower over, bidet, toilet and basin) one is upstairs between the two bedrooms the other is downstairs. Margaux comfortably sleeps four people with room for a baby or small child as the fifth guest. All linen and towels are provided except pool towels. The villa is cleaned on your arrival and at the end of each week of your stay there is a linen change with clean sheets, towels and t-towels, the swimming pool is cleaned on the day your arrive, mid week and the end of the week for each week during your stay, if the pool cover is replaced when the pool is not in use the temperature will maintain 26 degrees. 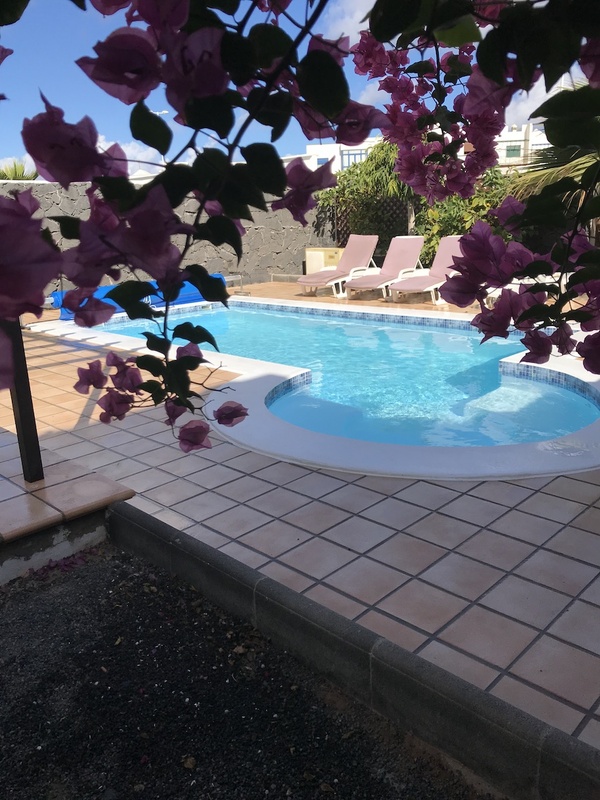 It is situated a five minute drive from the centre of Playa Blanca [30 minute walk] with a taxi rank and bus stop close by if you decide not to hire a car, taxis are approximately 4 euro into town and the bus is 1,20 euro and runs every 30 minutes. 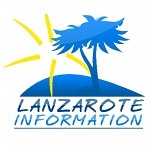 Once your booking has been confirmed and full payment made a full information pack is sent to you with all the facts you need about Playa Blanca, location of shops, restaurants, bars, beaches etc., plus ideas of things to see and do during your stay. The price for one week in Margaux for two people is £500 with a £5 per day supplement for extra guests. From the beginning of July to the end of August the price is £600 for two people with a £5 per day supplement for extra guests. Christmas and New year are offered at £650 for two people with a £5 per day supplement for extra guests. We have a special offer that runs in May and June for £475 for two people with a £5 per day supplement for extra guests. We are happy to accept either sterling or euro – euro will be calculated on the date of the booking.